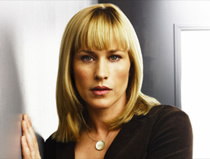 Allison DuBois (Patricia Arquette) is a devoted wife, mother, and law student who learns that she has the ability to speak to dead people and to see the future in her dreams. With the help of her loving aerospace engineer husband, Joe (Jake Weber), she gets a handle on and learns to use her special gift. She’s eventually able to convince her boss, District Attorney Devalos (Miguel Sandoval), and others like Detective Lee Scanlon (David Cubitt), to trust her abilities. As time goes on, it becomes apparent that Allison’s gift has been passed down to her three daughters; Ariel (Sofia Vassilieva), Bridgette (Maria Lark), and Marie (Madison and Miranda Carabello). Joe is returning from a business trip to Hawaii and calls Alison to tell her that he’ll be early. His plane hits some turbulence and crashes in the ocean. Seven years later, Alison starts having dreams leading her to believe that her beloved husband is still alive. Complete last episode synopsis. First aired: January 21, 2011. Yes! DONT cancel this show you morons! ‘Medium’ is the only vaguely intelligent and entertaining drama on TV period, everything else is utter pants. Are they gonna show Medium reruns on WGN America, Hallmark Channel, KDOC Los Angeles/I.E.,KCAL 9 Los Angeles, ABC Family, or Starz Kids and Family on 2012? Medium was my favorite show. I can’t believe it was cancelled. I guess it wasn’t violent enough for the sponsors?? I just found out the show was cancelled. I just thought it was off the past couple of weeks. I’m bummed, I thought the show was great. I hope you will consider bringing the show back. This show was the best ever. Everyone was magnificent and brilliant. Please consider bringing the show back with all of them. WHYYYYYYYYYYYYYYYYYYYYYYYYYYYYYYYYYYY? THIS SHOW IS FANTASTIC,INTELLIGENT AND EXTRAORDINARY! JUST BRING IT BACK! ALLISON CAN DREAM IT BACK! The reason I loved Medium and watched it all these years was the loving family relationship displayed on this show. The cast did a great job. I will miss watching it every week. Why was this wonderful show cancelled? It was always entertaining – the acting top notch – the family dynamics always interesting – We looked forward to seeing it every week. This has been my favorite show for years…certainly the ratings were good. What are the issues?? this is a bunch of crap this is a great show with great actors. dont cancel this show….